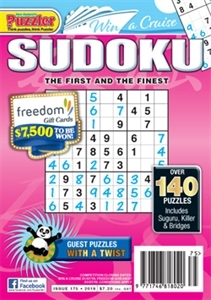 Sudoku lovers need look no further than Sudoku. Designed to suit solvers of a range of abilities, the puzzles in Sudoku are graded into three levels of difficulty. Detailed step-by-step instructions, with diagrams, on how to begin solving a Sudoku are included for beginners. You'll also find other equally challenging brainteasers from Japan such as Bridges, Futoshiki, Killer Sudoku, Loop-The-Loop, Suguru and Tatami. We also showcase new and creative puzzles, such as Campixu and Round The Block.